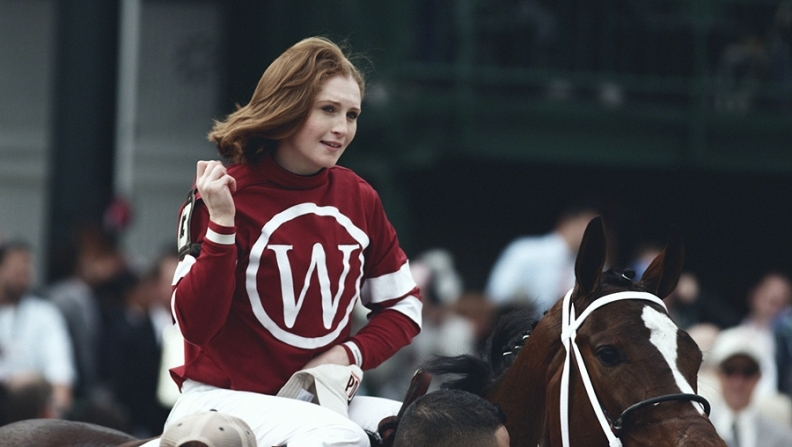 Kentucky Oaks winning jockey, Rosie Napravnik, is featured in one of the spots. Ram aimed to capture the attention of trailblazers and female buyers during Saturday’s 141st Kentucky Derby. The brand, in its partnership with the Kentucky Derby, highlighted the spirit of strong women and the courage to choose a new path in two television ads that debuted during the race Saturday. The first, “Courage Is Already Inside,” depicted hard-working women who have defied the odds and challenged stereotypes. The 60-second spot featured two-time Kentucky Oaks winning jockey, Rosie Napravnik, along with Canadian hunter Eva Shockey, the first woman in 30 years to make the cover of Field and Stream magazine; the Academy of Country Music Awards most-awarded female vocalist Miranda Lambert; and professional arenacross/motorcross racer Tiana Falls. “You can break a stereotype. Throw it into a whole ‘nother gear because the courage is already inside,” the voiceover said. Women make up 11 percent of the truck-buying market and influence even more purchases, a Ram statement said. “Women are emerging as leaders and influencers in traditional male-dominated fields, including horse racing,” Olivier Francois, chief marketing officer for FCA Global, said in the statement on Friday. The second ad, a 30-second spot called “The Pack,” emphasized Ram’s sales growth from 2009 to 2015, the statement said. A single sheep breaks from the herd while a Ram truck drives down a country road. The breakaway sheep joins the herding dog and Ram driver, becoming a leader, the statement said. Both ads were created with The Richards Group of Dallas, Texas. Ram was the official truck partner of the Kentucky Derby and Churchill Downs horse racetrack for the sixth straight year, the statement said. On Friday, Ram said its U.S. sales rose 4.3 percent in April to 40,864 vehicles. For the year to date, Ram sales rose 7.9 percent to 151,270 vehicles. Industrywide U.S. sales rose 4.6 percent in April and are up 5.4 percent for the year to date.